The Department of English, the College of Sakhnin for Teacher Education trains teachers for primary and junior high schools with a strong work ethic and a deep sense of commitment and belonging, teachers who are communicative, active, energetic and highly competent in their field. As an integral part of their studies, students in the English Department are required to demonstrate proficiency in the language and a solid working knowledge of literature, linguistics and pedagogy. To provide them with these skills, they are exposed to these disciplines throughout their four-year course of study, with a strong emphasis on teaching English as a second language. In the course of their studies they are also exposed to a variety of issues in education and are expected to learn a variety of teaching methods and, progressively, to deepen their skills in applying them. To these ends, they are given wide exposure to learning subjects appropriate to intermediate classes and considerable opportunity to practice their skills in actual classroom situations. Our goal, in short, is to produce certified teachers whose didactic skills are solidly grounded in a wide and deep understanding of the English language and how it may be taught. - Take part in drama and music workshops: fun, and alternative way for teaching. - Are engaged in intensive programs of meeting with American Students. - Write and edit their own magazine. - Have access to an audio-visual center. - Have access to a wide variety of reference books and journals. - Meet teachers to talk on the plans of the Department. - Have the chance to reflect on teachers and courses. - Are highly qualified: professors, doctors and post-graduates, with a deep sense of commitment, openness, care, understanding and competence. - Are deeply engaged in scholarly activities: writing academic articles, textbooks and books, and taking active part in international as well as national conferences. - Are discerned for their creativity: writing children's stories, short stories and poetry. The section offers semester and intensive courses in English for Academic Purposes (English as a foreign language). The goal of these courses is to train the students to deal with authentic texts, either in their entirety or abridged, to familiarize the students with the structure of a research article with emphasis on understanding the title, text schema, introduction, procedure, method, scaffolding and conclusions, to expose the students to new vocabulary and reinforce previous learning, to engage the students in continuing examination of the complex sentence and its features, and of paragraph organization, to train the students to ascertain the author’s tone and style and understand their effects on the reader, to provide the students with the opportunity to see the applicability of articles learnt to the Israeli scene, to enhance the students’ oral proficiency and their English language experience through conducting various activities relevant to educational issues and topics and to enable students to read academic texts in their fields of study. Students receive instruction in macro-level reading and micro-level reading, and become aware of their own psycholinguistic processes. The courses do not place emphasis on spoken language. כל סטודנט שמתקבל ללימודים חייב להציג ציון באנגלית ממבחן פסיכומטרי, מבחן אמי"ר או מבחן מיון. 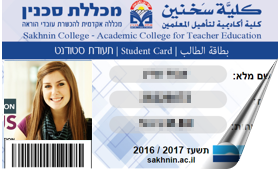 הסיווג לרמות לימוד במהלך התואר הראשון אך ורק על סמך מבחנים חיצוניים הנהוגים ומקובלים בישראל דוגמת מבחן אמי”ר או אמיר”ם, או על סמך פרק האנגלית בבחינה הפסיכומטרית.